Although born in England, Tom Connolly fell in love with baseball as a teenager and became an NL umpire in 1898. Frustrated with the circuit by 1900, he signed on to the AL in 1901. Thirty years later he was named chief of AL umpires, his position for another 23 years. 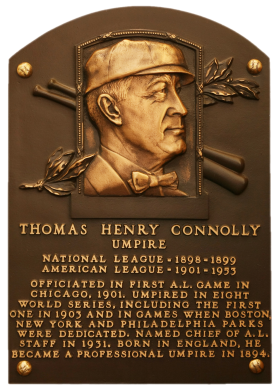 Connolly and Bill Klem became the first umpires named to the Hall of Fame, in 1953. 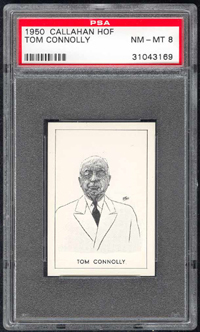 Connolly umpired in eight World Series, including the first in 1903. Comments: In October, 2003 I purchased a PSA 6 Callahan (w/ PSA 7 Klem, PSA 6 Landis, and PSA 7 Ban Johnson) off the PSA Message boards from a hobby friend, Brian Dwyer. In December, 2004 I purchased a raw example (w/ Harry Wright and Bill Klem) off the McAvoy Sportscards website for $11.50. The card was submitted to PSA and came back graded NM-MT in March, 2005. 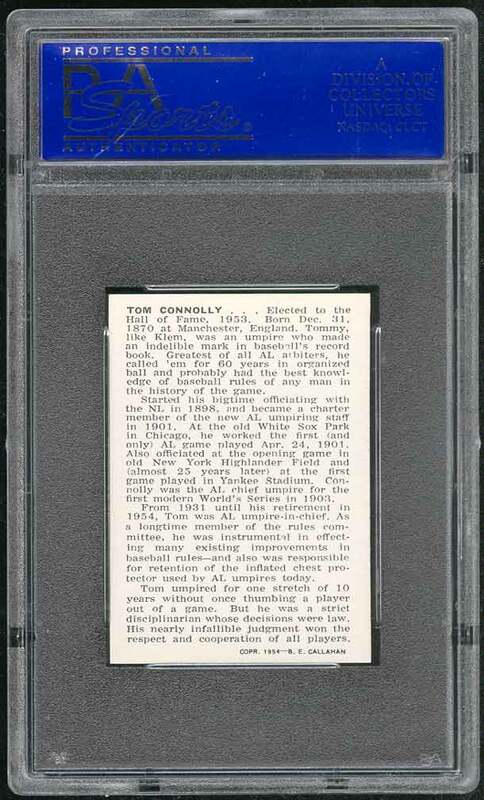 I've been looking to upgrade this to a PSA 9 but have not had the right opportunity present itself just yet.